Bourach, in several forms both in Scots and in Gaelic, is one of those words that probably every language has—never translatable succinctly, yet capturing a reality that everyone can observe and recognize. It means a mess, a shambles, a dog’s breakfast...but if you try to define it precisely, you might end up in the state that the word connotes so well. It is a word that a parent can deploy with equal force to deprecate either the state of a truculent eyeball-rolling teenager’s bedroom or a state of affairs in business or politics brought about by deplorable incompetence. It is in the latter context, specifically referring to the Brexit process, that you would have heard this lovely word used in recent weeks, not only in Scotland but also in Westminster’s House of Commons. We are living through historical moments, a new one every day. We would prefer a more noble procedure, a weightier debate to match the significance of the moment. Viewing the shambles, the bourach down south, some Scots want no part in it. The Edinburgh Parliament has the legal and political mandate to call another independence referendum, and it is under increasing pressure to deliver it soon, to escape the current and future calamitous shambles. Incompetence, anger and yelling have topped every news bulletin for weeks. The situation changes, and the quicksand deepens, every day, if not every hour. The underlying issue, as we are seeing ever more clearly, is the failure of the political system, the system that has been in place for at least 100 years and arguably since the United Kingdom came into being at the beginning of the 18th century. There are now deep worries about the long-term damage not only to the political system but to the social fabric of England. The Irish Times writer Fintan O’Toole, one of the sharpest of observers, suggests in the Guardian that the whole bourach is “the result of the invisible subsidence of the [British] political order over recent decades.” There are now deep worries about the long-term damage not only to the political system but to the social fabric of England. The growing willingness in Scotland to look toward independence as a way to keep European Union membership is a threat to the British State’s continuation. Elsewhere, particularly in nonmetropolitan areas of England, it looks very different. Certain politicians cynically and opportunistically used the arrival of some 200 refugees on England’s southern shores to whip up anti-foreigner feelings. The numbers were tiny (Britain averages about 25,000 asylum applications per year), yet this was declared a national crisis by the government. The subtext is not new and is familiar elsewhere too—these are not refugees but migrants, so it goes, bent on overwhelming our pure culture. As a distraction from Westminster disarray over the European question, it worked for a few days. Certain politicians cynically and opportunistically used the arrival of some 200 refugees on England’s southern shores to whip up anti-foreigner feelings. Getting back to Brexit, a disorderly, “no-deal” outcome, which means what it says—walking away from the E.U. at the end of March, leaving all sorts of bilateral arrangements automatically cancelled and inoperative—is championed by many. Certain proponents have been claiming that this is what the 52 percent of those voting for Brexit wanted, but this is an absurd claim, as nothing of the looming catastrophe was ever mentioned in that campaign. Still, some analysts are beginning to suggest this calamity as the most likely outcome. Official call-up orders for Army reservists have added to the 3,500 troops already on standby. Industry could falter; the government has admitted that the economy will contract. France has announced its own no-deal contingency planning, at a cost of millions of Euros, for alterations to ports and the like; the Irish Parliament is discussing similar plans. Yet many Brits still want to go. Is this mass denial? Has the governing class completely forgotten about compromise, so long said to be a particularly British virtue? The staggering parliamentary defeat for Prime Minister Theresa May’s negotiated exit deal pushed the country even further from safe dry land. Not that long ago, when the system wasn’t in near-collapse, that vote would have meant resignation. Now it means only deeper confusion—and Ms. May is still there. 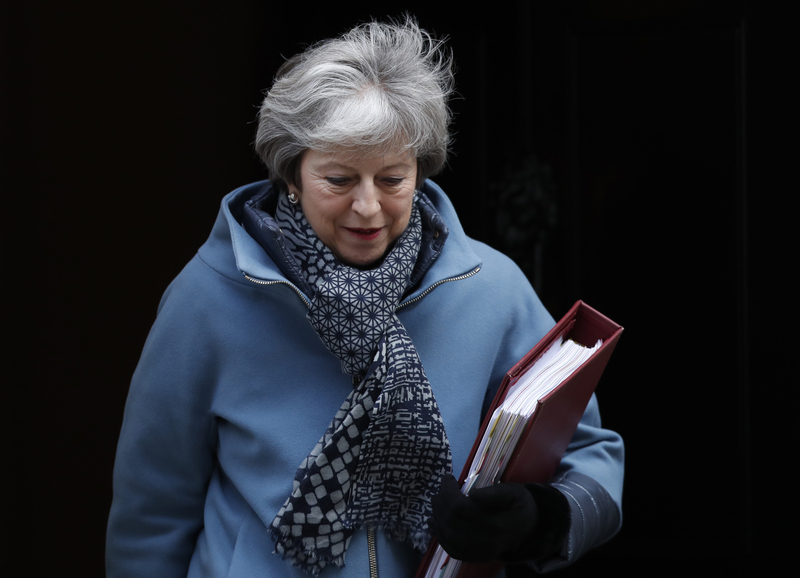 The government still has options, such as a second referendum on Brexit, and the legality of canceling Brexit has been established by the courts. But the inability of parliament and government to manage things has not only estranged already disillusioned ordinary people but has also increased Scottish resentment. Scotland’s future is now tightly bound up with the European question. The nationalist movement, of which the ruling Scottish National Party is one part, is fervent again. The new year has seen growing pressure on the S.N.P. government in Edinburgh to detach from London’s bourach; the first minister, Nicola Sturgeon, has performed a delicate waiting-game. A certain tension evident in the pro-independence movement centers on when to make the next move. Current polls suggest that a majority of Scottish residents want a second independence referendum should Britain leave, while almost three-quarters now think that Brexit should be canceled. Ms. Sturgeon, in London meeting her Westminster group, forecast a decision “in a matter of weeks.” Recent polling suggests that a slight majority in Scotland would now support independence if the current United Kingdom leaves Europe, and a remarkable 52 percent in Northern Ireland said in one poll last fall that they would opt for a united Ireland if Brexit goes ahead. The future of the British state looks less and less secure, as its political system implodes. It is indeed a bourach, messier than the worst teenager’s bedroom; right now it’s not easy to see how it is to be tidied up, or who is going to wield the broom. Is this another example of elites vs the common person? City states vs the less affluent country side? It is quite predictable as it has been going on for centuries. The rich/elites will always take care of themselves and their families first. It is interesting that in the country where this social order was first overthrown, it is reverting. Why is this still being debated. The people voted to leave the EU. To not make good on the will of the people is a threat to democracy in the birth place of modern democracy. Get on with it! This whole mess was made when the population of the UK lured by the lies and blandishments of cunning operators emphasising a step-by-step benefit accruing sold their birthright for a mess of pottage. Brexit is recovering from that disaster and is bound to be painful, like surgery or childbirth. I never heard of bourach, but my mother would have said "sic' a stramash", which is untranslateable, but has the same sense of a big mess. Scottish independence and affiliation with Europe would be a good idea, and a continuation of european relations that Scotland has always had, before Scottish royalty agreed to form a union with England 300 years ago. The UK govt. is dysfunctional, just like the US, for many of the same reasons--it no longer "represents" the people, but only special interests. Given the proliferation of social media and new technologies, it is much easier today to get instant voting by the public on major issues, without having to rely on a physical person in a parliament to do it for you. It seems crazy that in both US and England the whole country is being held hostage by the incompetence of single individuals, a man here and a woman there. There is no doubt that the system is broken, and times are ripe for demagoguery.......or for real leaders to step forward.